Bord na Móna’s resource recovery business is at the forefront of addressing waste management in a way that makes environmental and commercial sense. From household waste to a company’s waste management chain to treating competitors’ waste, AES can manage it all, using the latest technology. With 6,000 commercial customers and 60,000 domestic customers, AES’s five waste transfer centres handle about 300,000 tonnes of waste per year. Over the next four years, Bord na Móna plans to increase that 50% of landfill diversion up to 80%, so that only 20% of material will go to landfill. And much of that process will rely on investment in specific technologies. “We have planning permission at our Drehid landfill site in Co. Kildare for a 25,000 tonne brown bin waste composting facility that would be the largest of its kind in the country,” said Tom, an accountant by trade with a background in logistics industries. “It will convert the contents of the organic brown bin into a material that’s capable of being introduced into our growing media products in Bord na Móna’s horticulture business. That will be a €7m investment in technology and we expect to have that system up and running early next year. The irony is that the customer will most likely never know the effort and technology used in better managing their waste. But by segregating the waste efficiently in the bin at the back of their house or factory, that customer is a vital cog in helping the waste industry to make that waste a valuable resource. In terms of the Energy division, at it widest scale, most waste has energy potential. “With the guys in Energy, we’re putting together a proposal to seek EPA approval to allow us to create a biomass product from waste timber,” said Tom. “We end up with about 10,000 tonnes of waste timber per year and rather than shredding that and it ending up as landfill cover, we want to segregate the clean timber and send it to Edenderry power plant as fuel. In 2007, the quantity of municipal waste recycled increased by 3.6%, household waste by 8% and packaging waste by 14%. In 2007, 26% of household waste was recycled. While satisfactory, there remains considerable distance to reduce the land-filling of household waste to 50% by 2013. In 2007, 64% of packaging waste was recycled, diverting more than 55,000 tonnes of packaging from landfill. 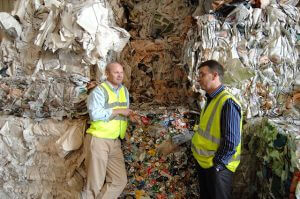 This exceeds the EU recycling target of 60% by 2011.